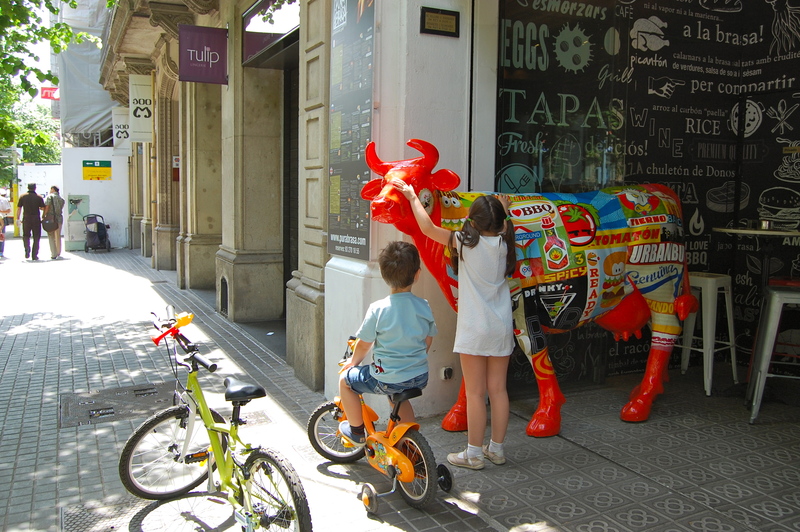 Walking with the kids through the city is an adventure in itself. 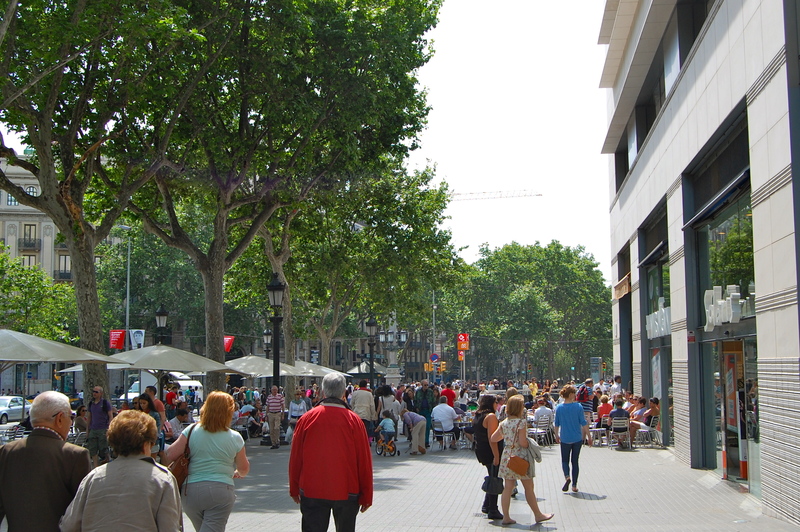 You get to discover buildings, shops, cafes, and plazas. You get to fall in love with the city over and over again. 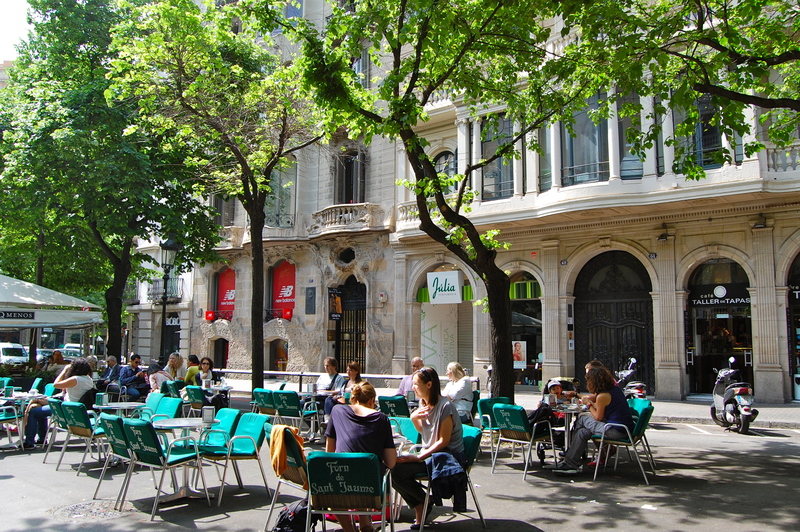 I like Barcelona for its streets, for its trees, for its cafes, and for its people. 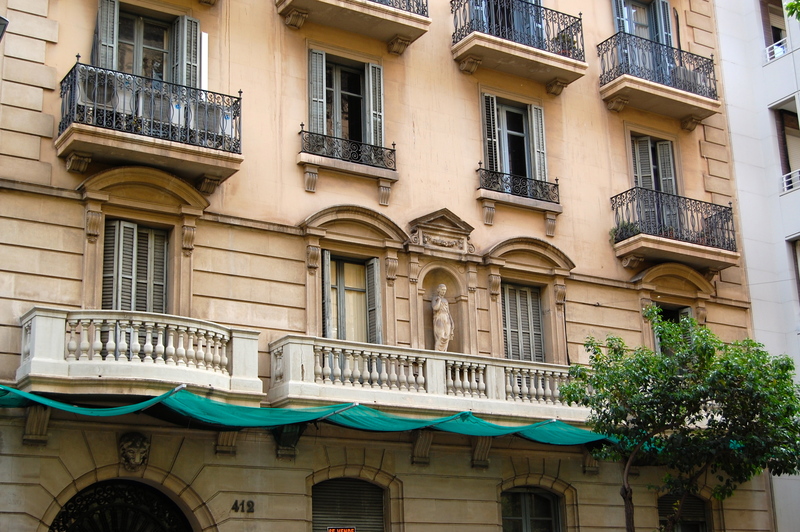 My mom used to tell all her friends that she loves Barcelona for its balconies. 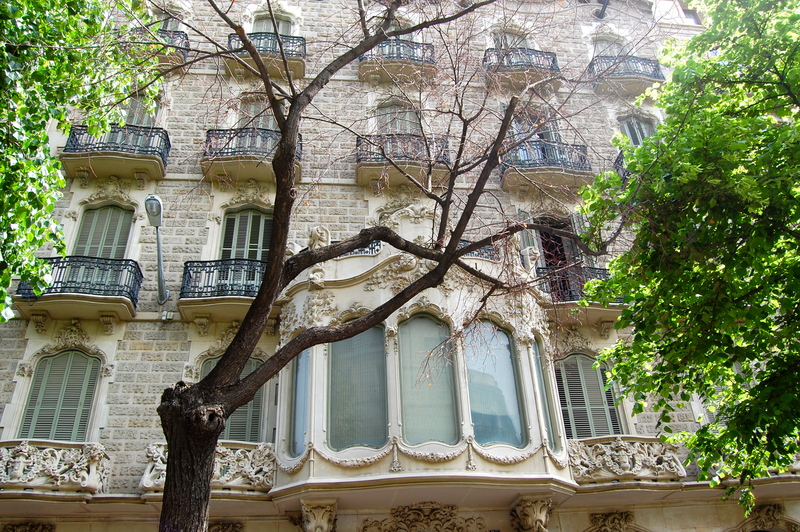 And she was right, those balconies make the streets look delicate. 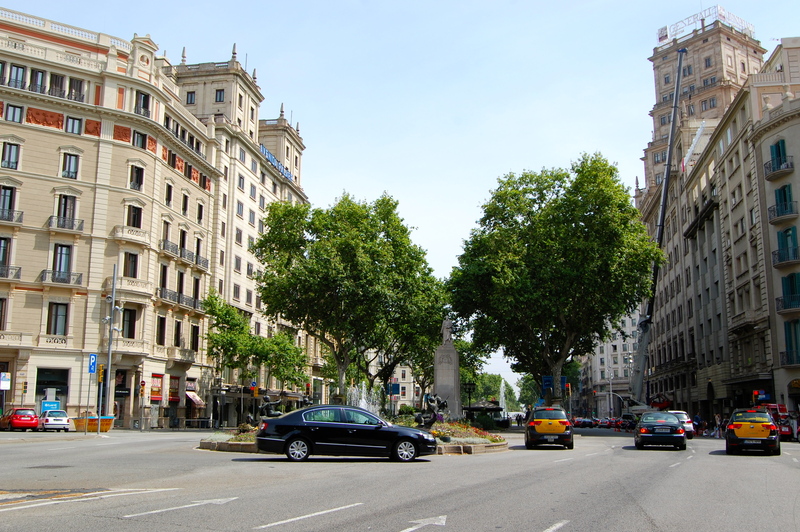 One of our favorite routes with the children is from our house on Muntaner Street to Placa Catalunya. 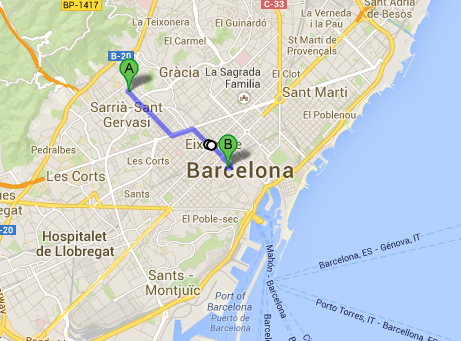 The route is 4.2 km long and it is mainly downhill (walking towards the sea). 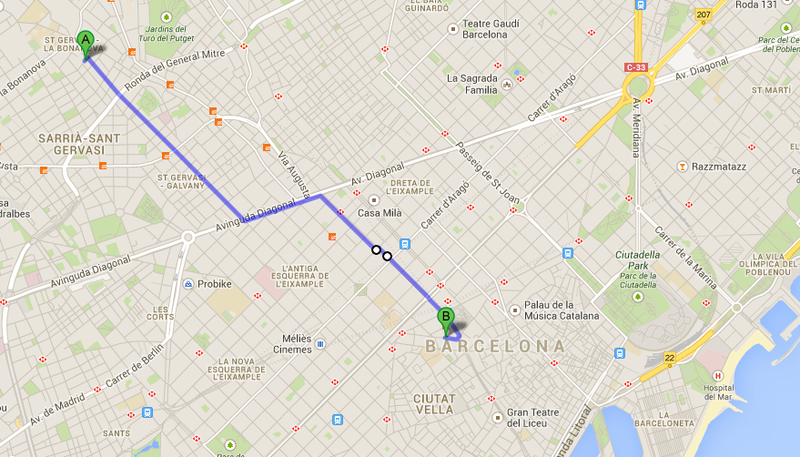 We do this route almost weekly with slight variations of the streets we walk on and cafes we stop at. 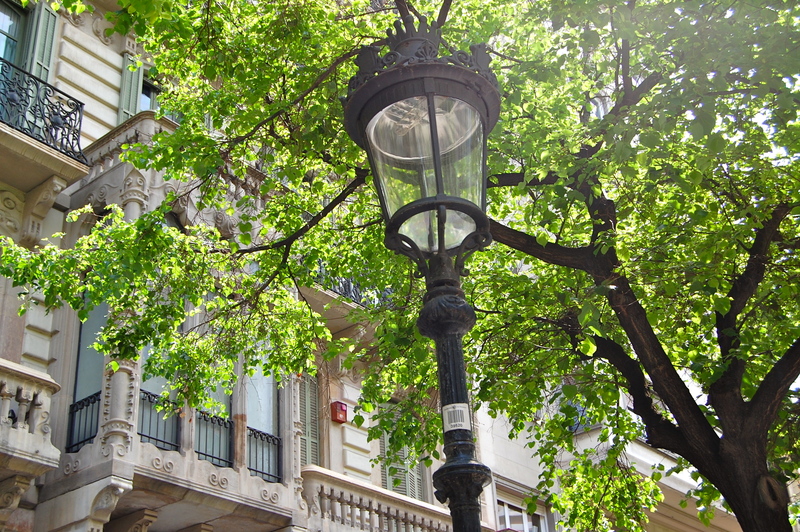 Thanks to these walks the children have a very special relationship with the city, they know it like the palms of their little hands. Here are two screen prints of the route. 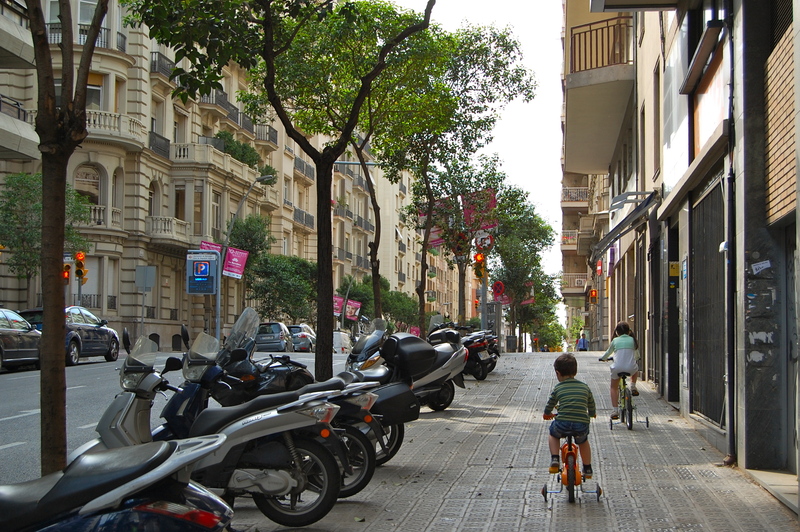 Getting out of our house around 10am we go all the way down the Muntaner Street. The kids stop at every stop light and wait for me. 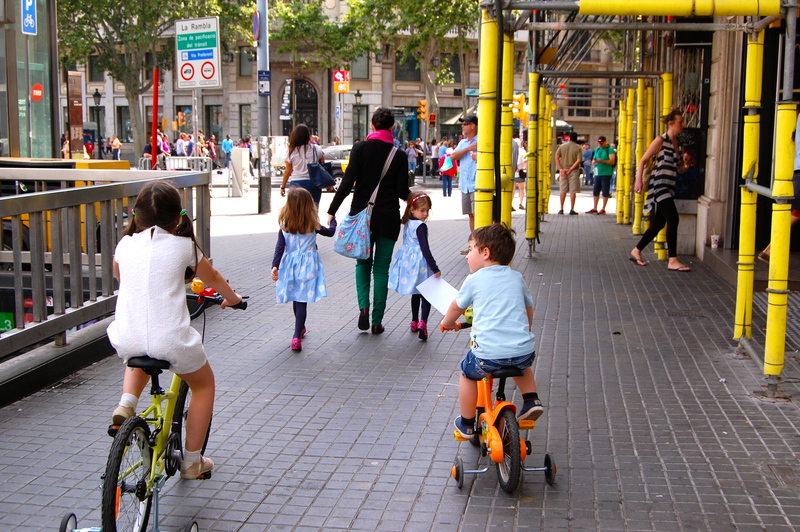 They are used to biking in the city. 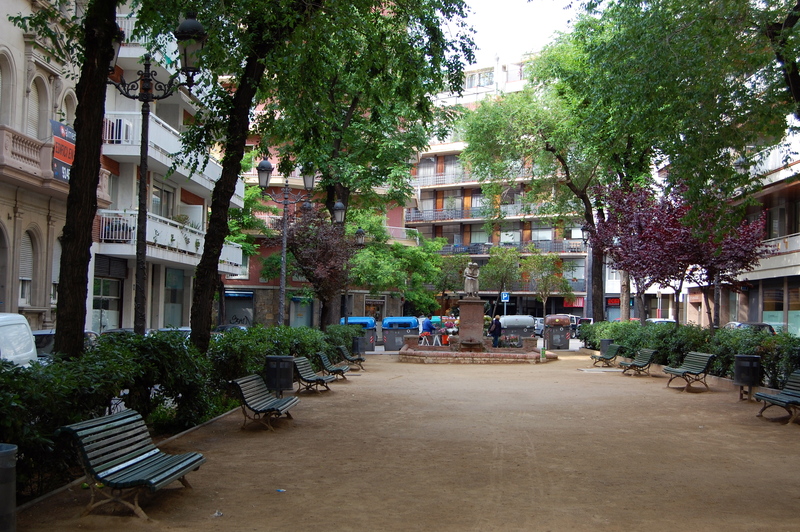 Here is a small park that is empty right now. In fall and winter a man was selling roasted chestnuts in this park. 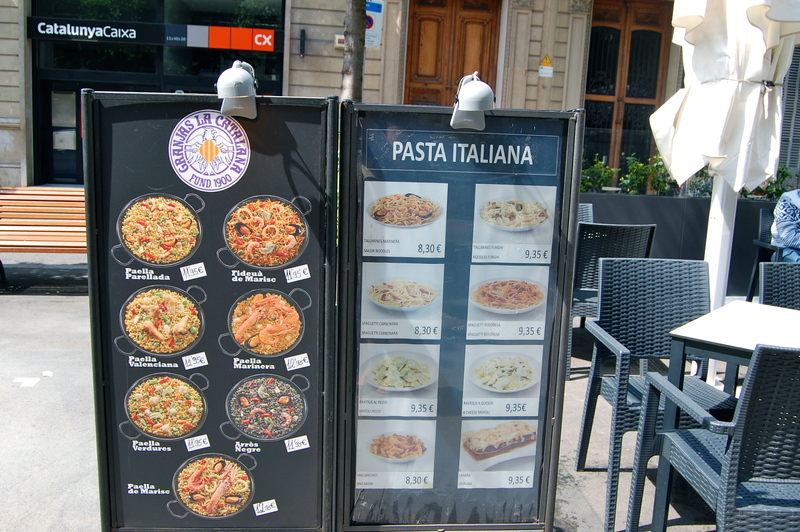 The kids and me used to buy those at 3 Euros a dozen. 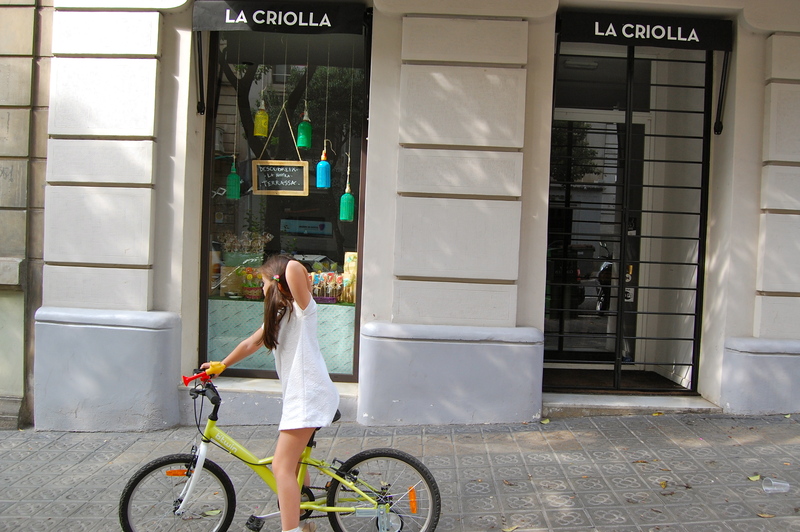 La Criolla cafe is still closed. 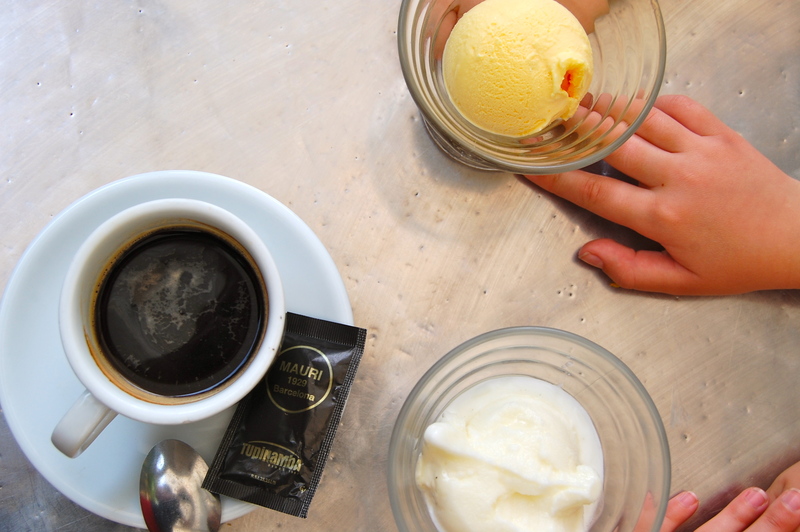 When it is open sometimes we have coffee and croissants there. It has a nice patio inside. Lemon trees with big lemons grow in that patio. 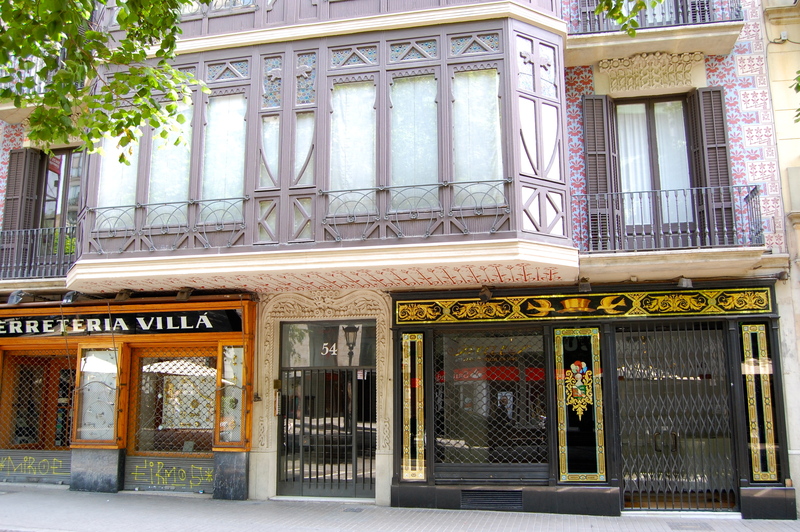 And here is a house in front of La Criolla. 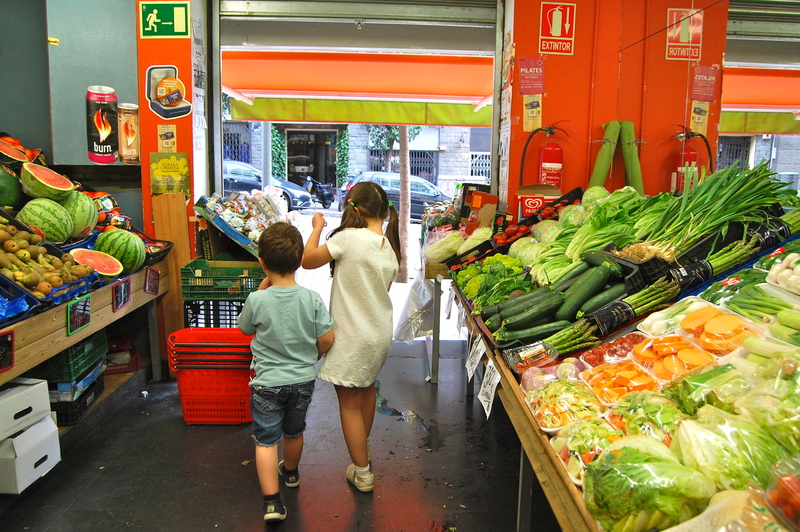 There is a small fruit and vegetable store that is open on Sundays. 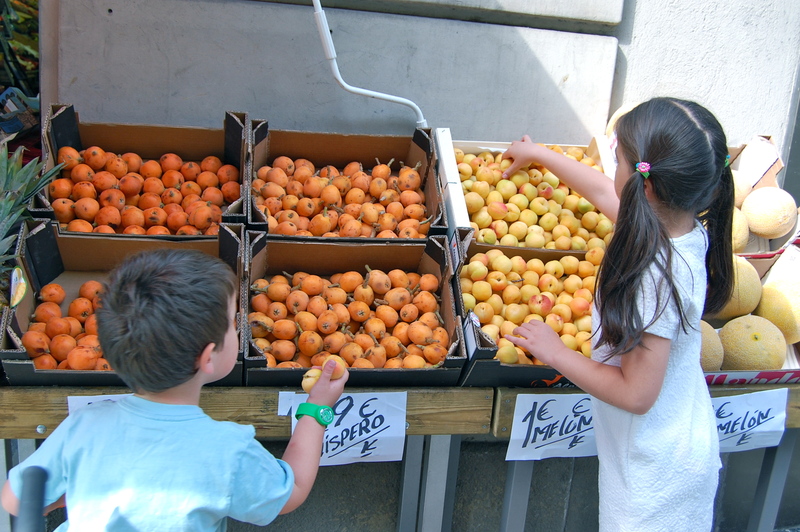 The kids take a bag and pick some apricots and loquats (nisperos). 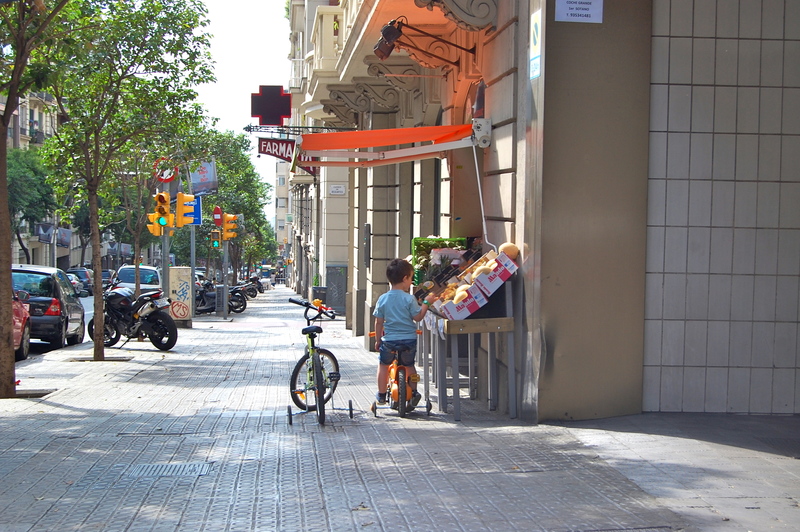 We get the fruits and they eat one of each right there while riding down the Muntaner Street. Those fruits feel like war trophies for them and they laugh with their mouths full. 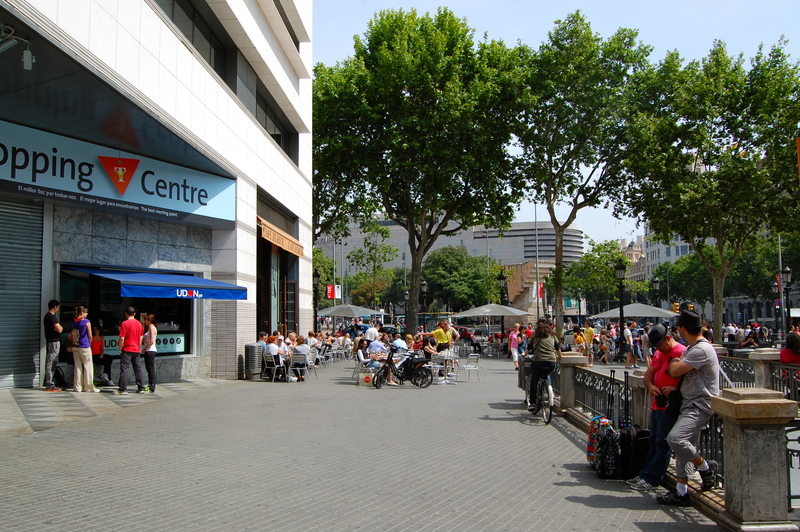 We get to the Crusto cafe at the cross of Muntaner and Via Augusta. 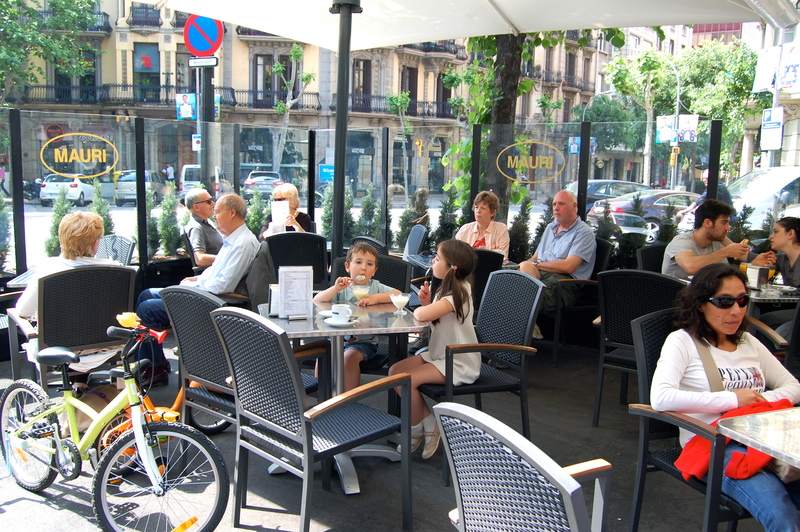 It has three tables outside and fake olive trees on one side of the tables. 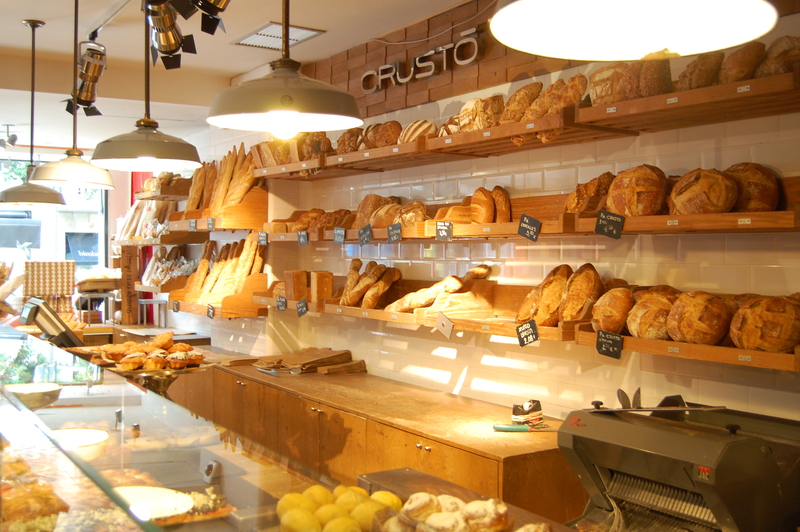 The coffee and bread are very good there. 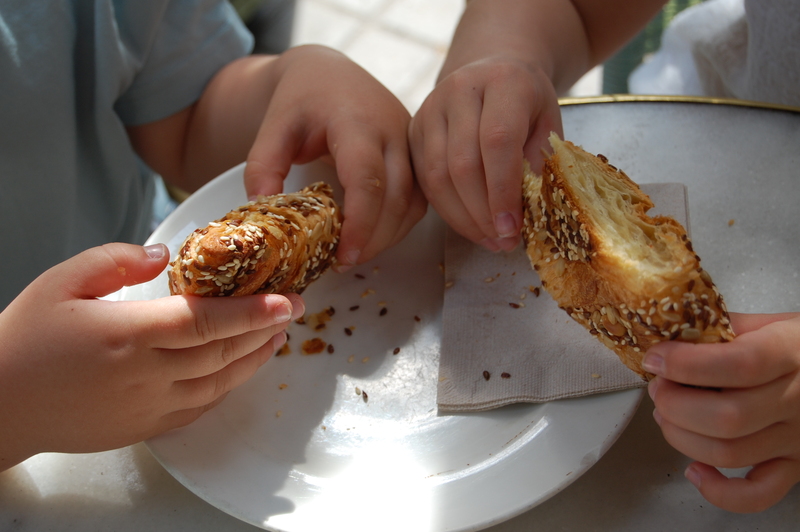 Kids share a croissant. 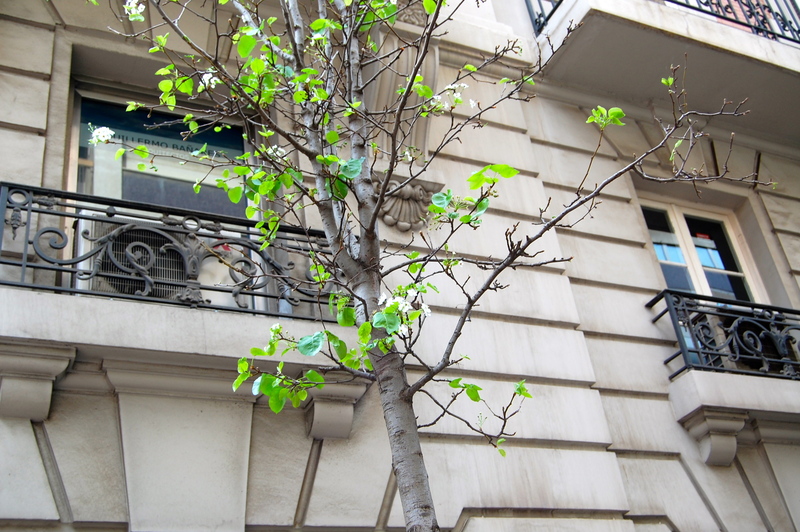 We notice a tree with little while flowers while waiting on a stop light. Here is a large house that has all kind of mystery stories around it. 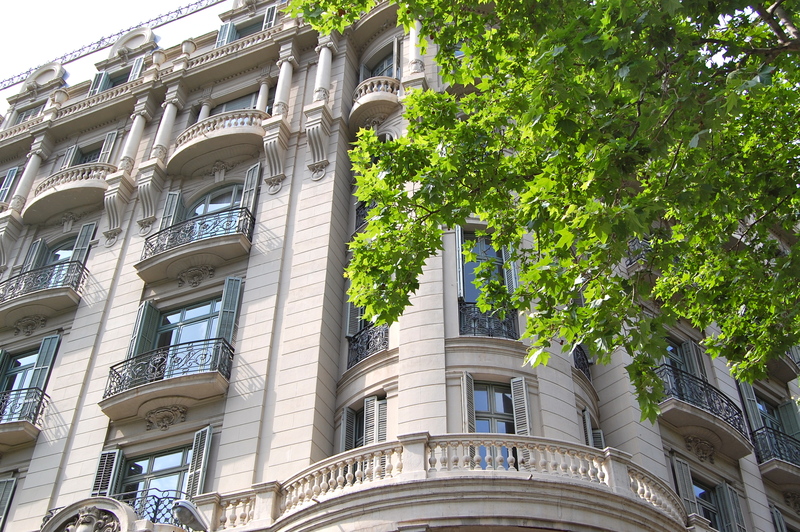 The house used to belong to a very rich textile dealer. The man also collected original paintings. In his will he donated his entire art collection to a state museum. However, his daughters decided that this was not fair and sneaked into the house this past winter and “stole” all the paintings. As newspapers said it was due to the high monetary value of the collection. We get to Av. 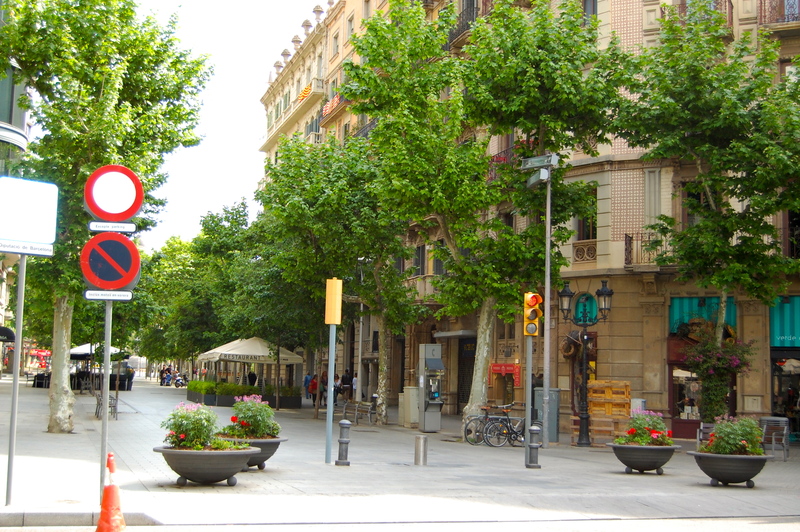 Diagonal and turn left here. 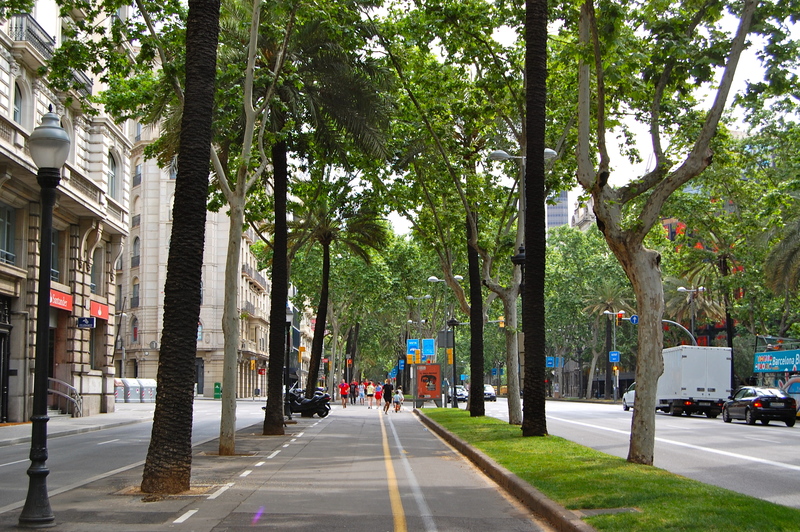 Diagonal is great for cycling as it has a special bike path. 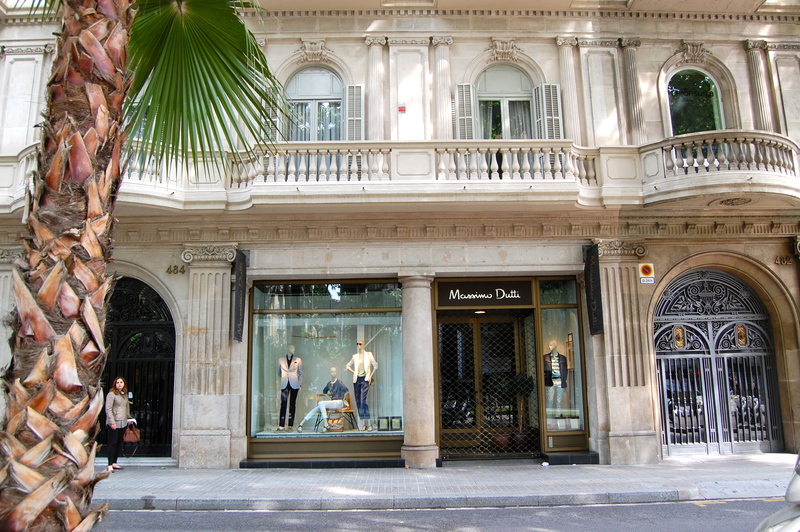 Here is one of the stores that I like. On Sunday everything is closed here. 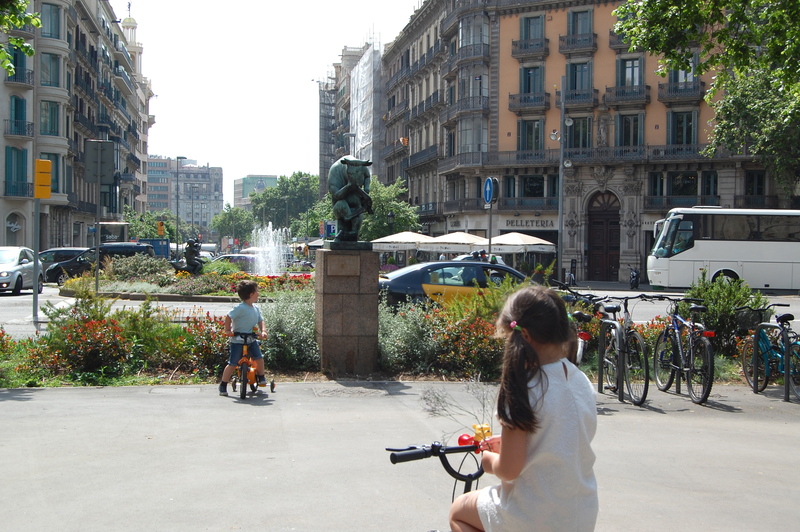 The kids ride fast on Diagonal and in couple of minutes we reach Rambla de Catalunya. Here we turn right and go down again. 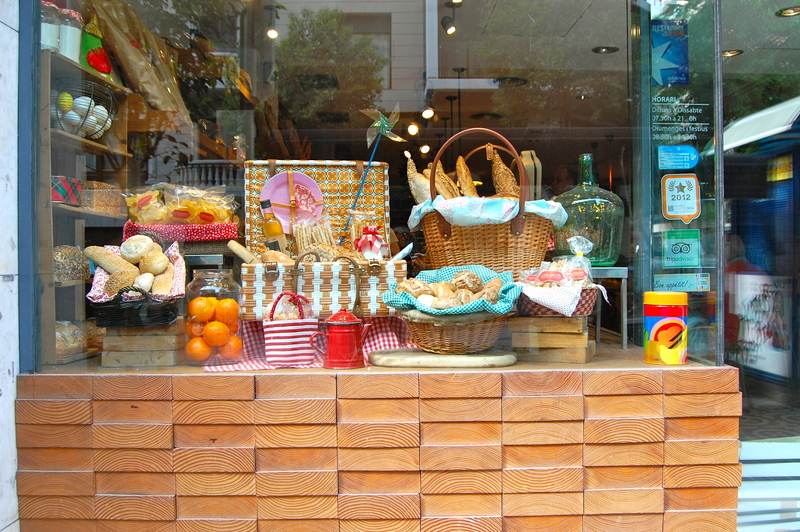 We pass by Farga cafe. 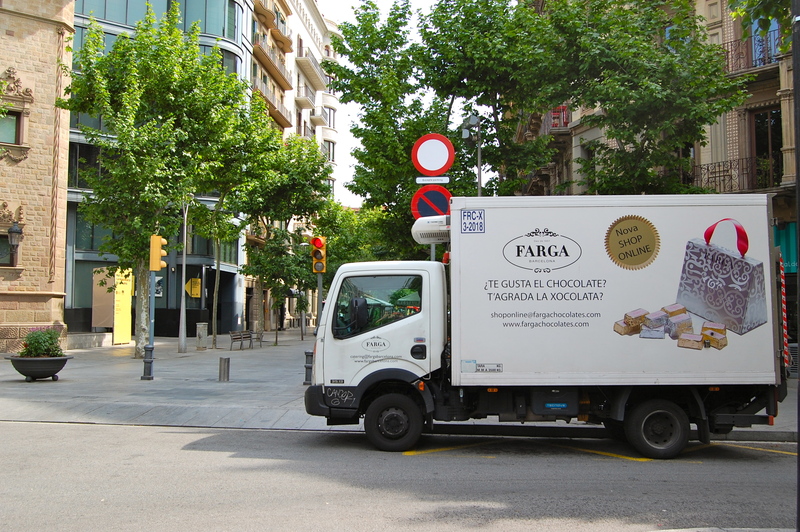 The Farga delivery truck is parked on the street. 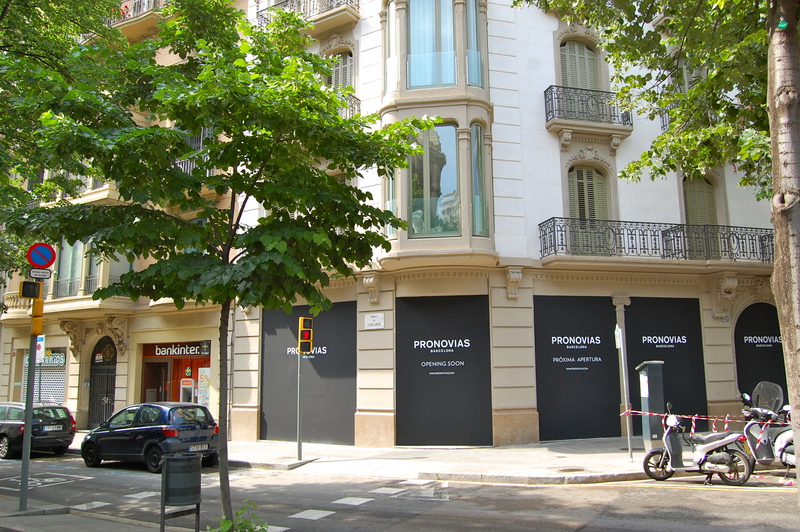 There is a new Pronovias store opening on the corner of La Rambla de Catalunya. Thirteen years ago I got my wedding dress at one of their stores. 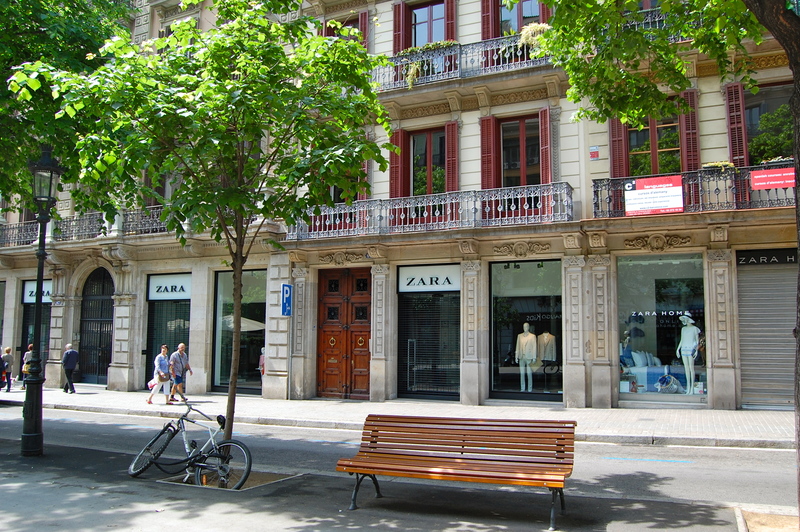 When I was twenty-one I remember passing a Pronovias store on Passeig de Gracia and falling in love with one of the dresses I saw in the window. I remember the dress perfectly well even now. Two years later I got married. It took ten months to get my dress done with them. My two roommates used to come with me to the monthly fittings. One of my roommates was Japanese. When I asked her how I looked she said, “Like a tomato”. This was the last thing I expected to hear then. She told me I blushed non-stop while trying the dress. And we all laughed a lot. Many years have passed. My marriage did not proof to be as strong as it should have been. Still I got two children and I appreciate what I have learnt about myself and others. The friendship with my roommates survived the distance and improved with years. 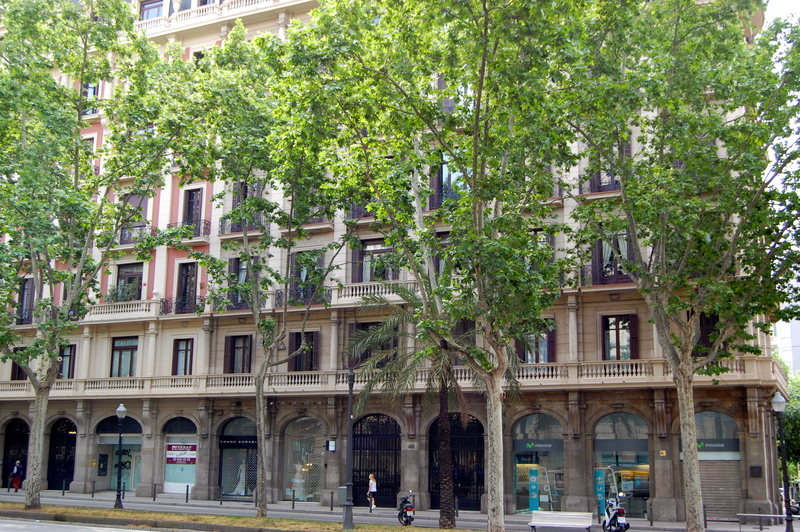 And I realized that I like the fact that Pronovias keeps opening its stores in the city. 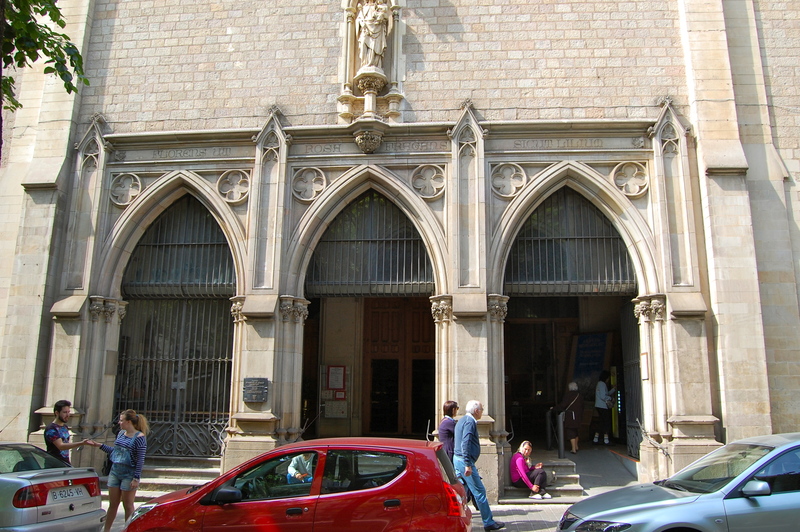 Here is the church that I like, because couple of times I went there with my family on the Christmas day. And here is a small side street in front of the church. 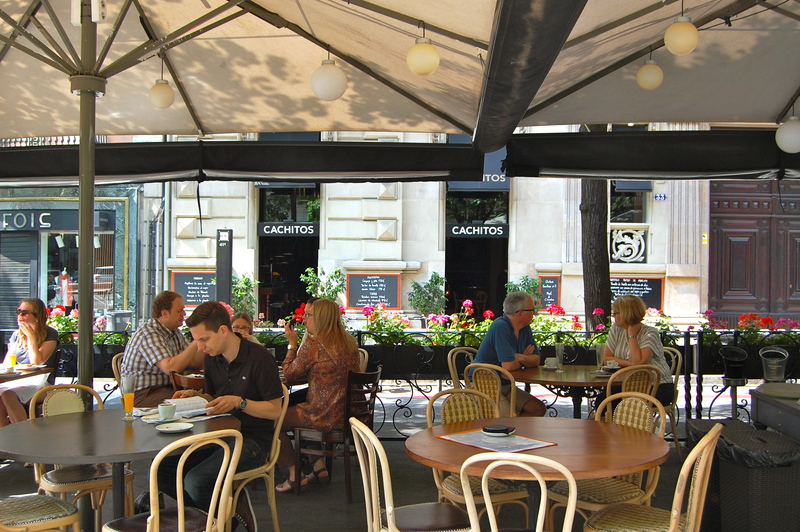 There is a beautiful restaurant on this street. And I have never been there. One day! 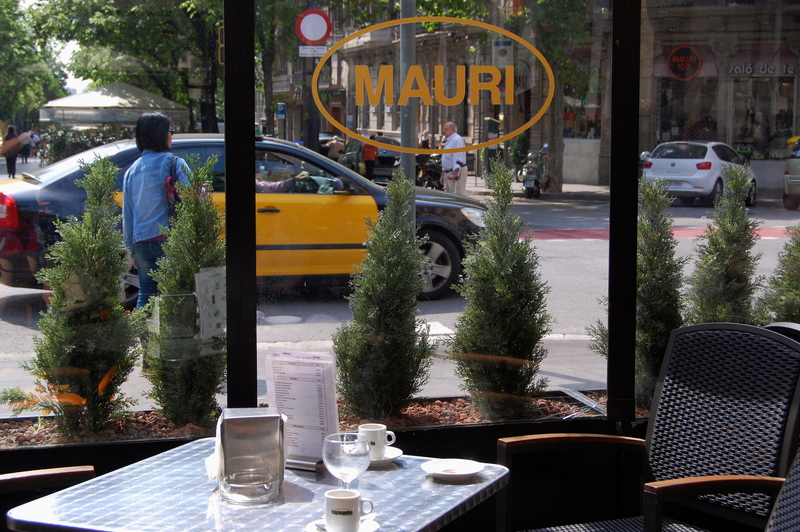 We get to Mauri cafe. 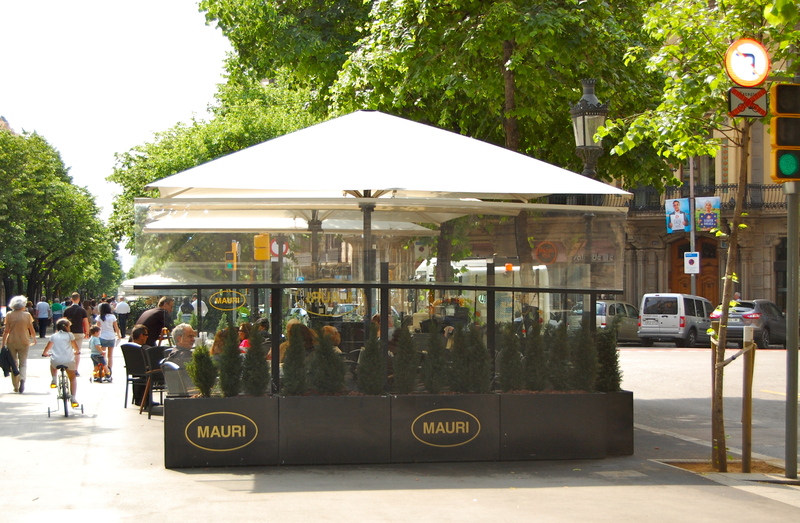 This is one of the oldest cafes in Barcelona. 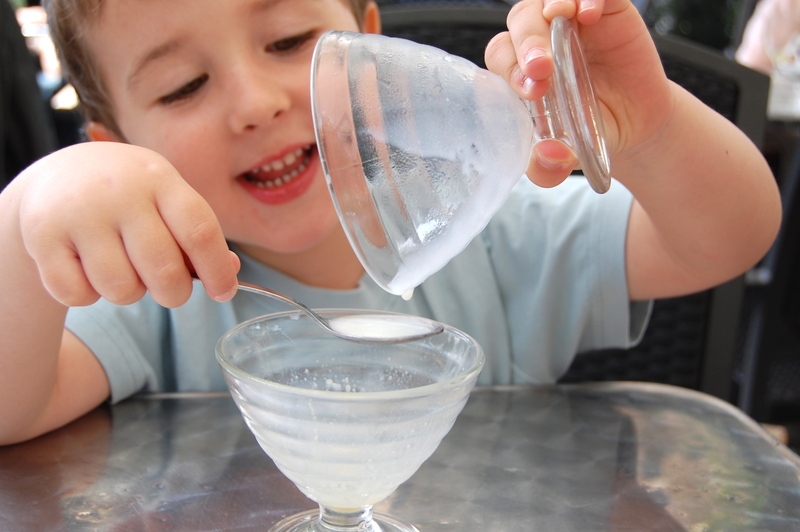 According to the kids it has the best ice-cream in the city. And here is La Bodegueta, a small and cozy wine celler. 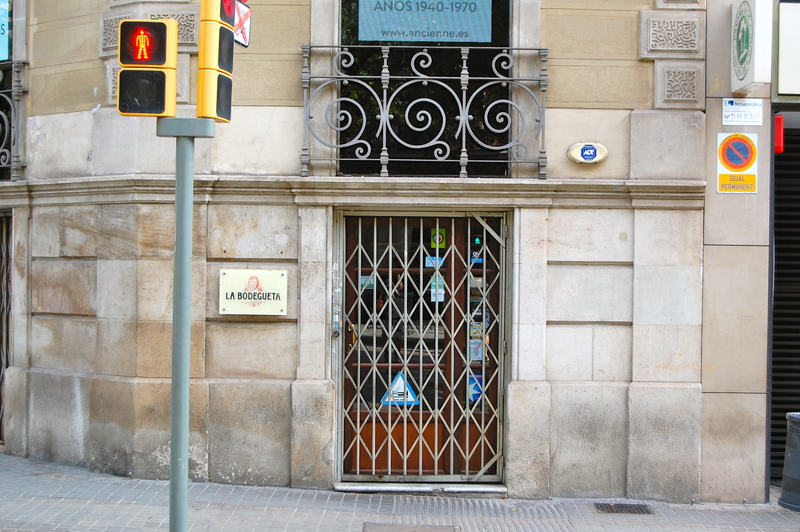 It is closed at this hour of the day. Can’t remember how many times we had a glass of wine and olives here after midnight. 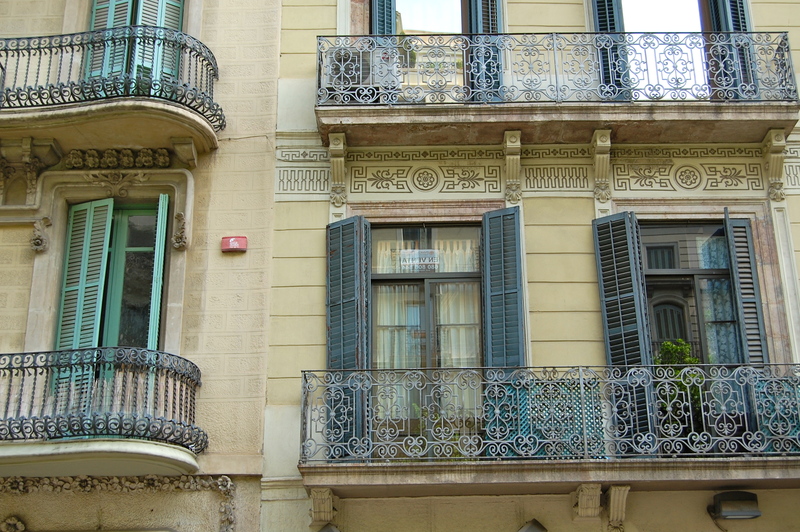 And here are some more of those balconies that my mom likes so much. 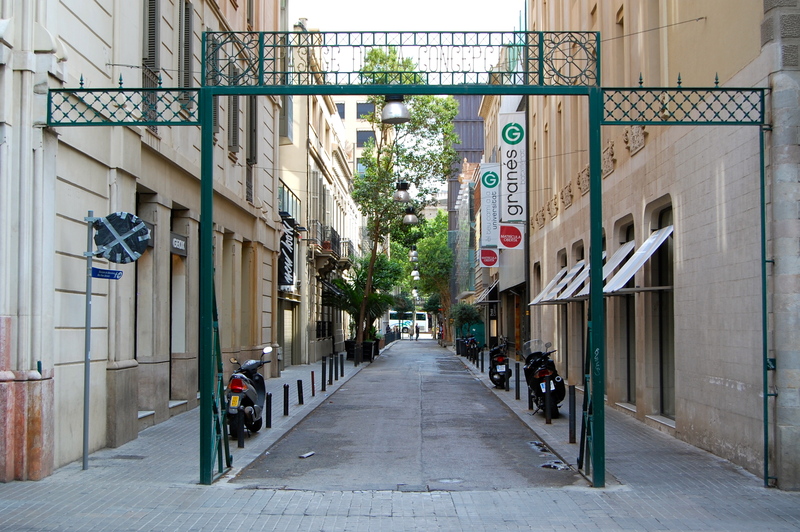 We cross Arago Street. 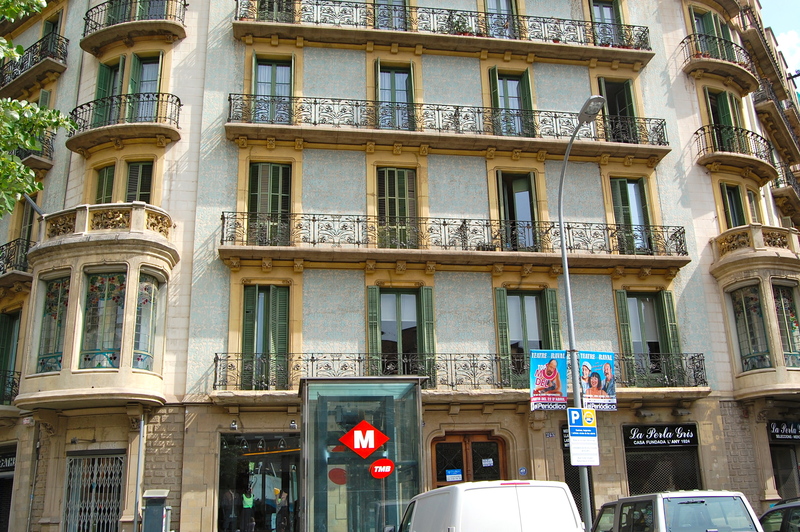 The terra-cotta building with wires on top is Tapies museum. 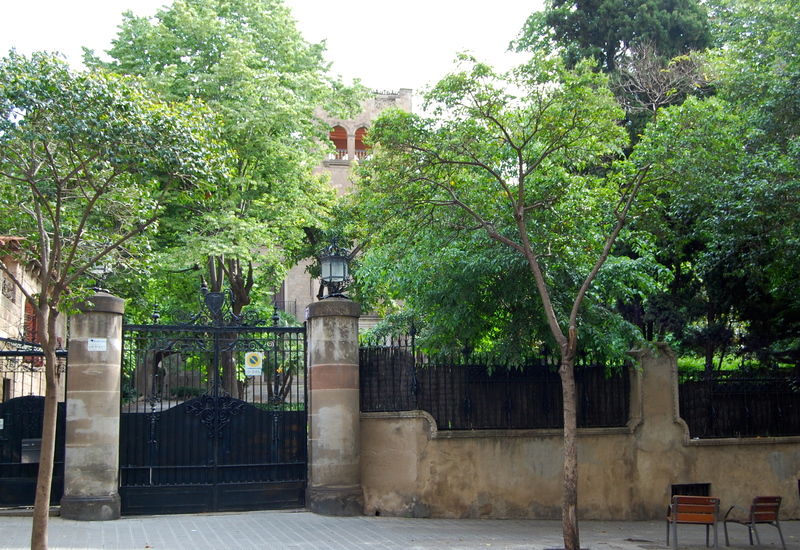 I visited it once with my class when I was in the high-school. I remember it was very weird, I could not believe that people seriously thought that this was art. 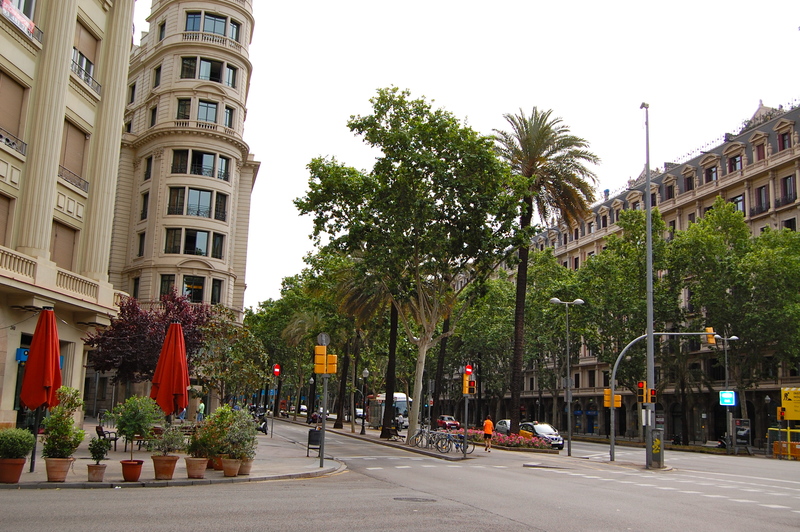 It becomes more and more touristy as we get closer to Placa Catalunya. 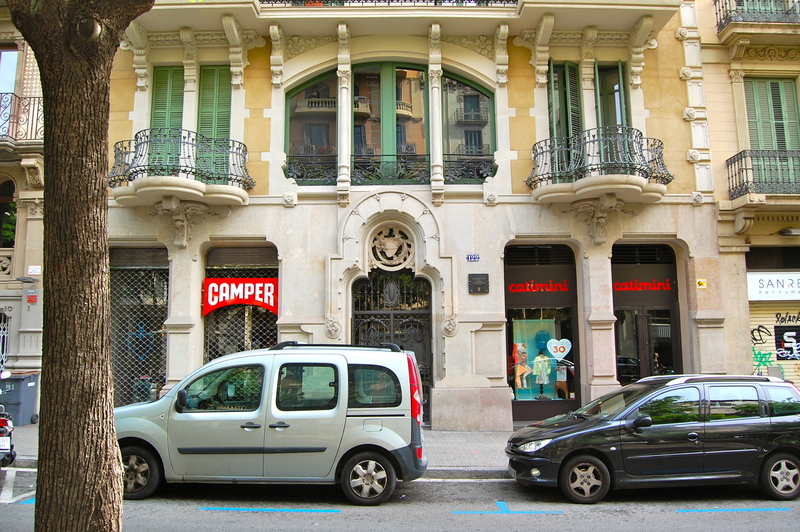 Now we pass by hotels, cafes full of tourists, and typical “touristy” food offering. 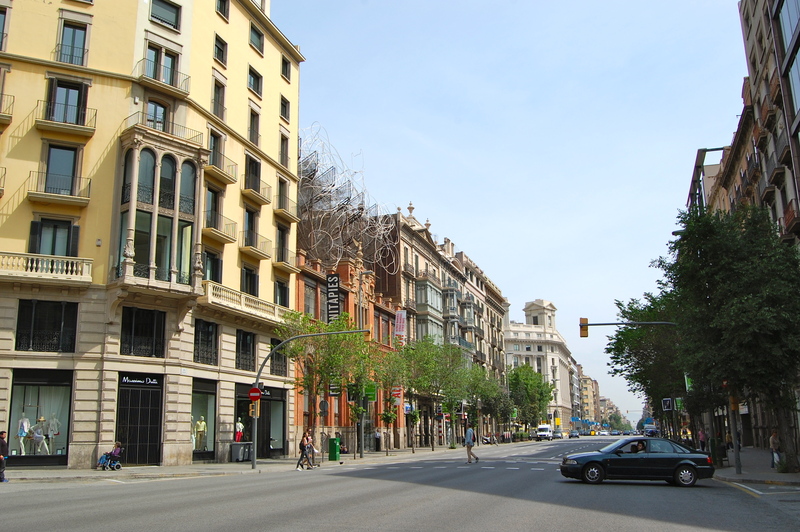 We have been walking for 2 hours when we reach Gran Via with Placa Catalunya in the background. 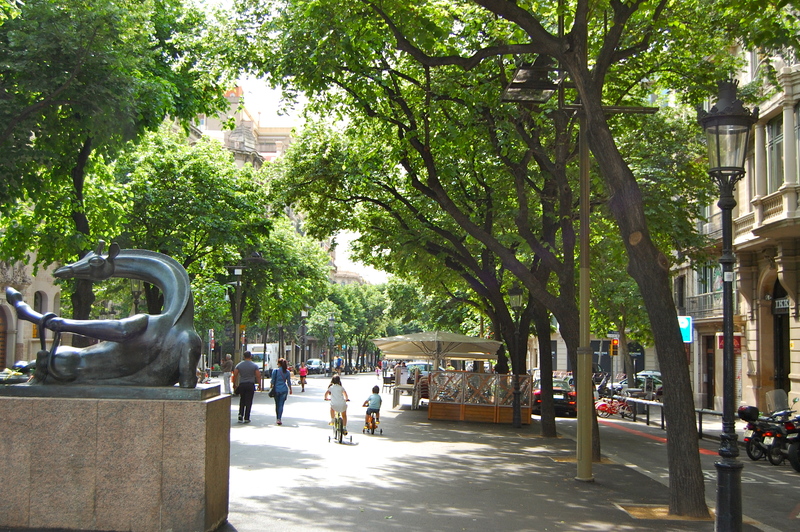 Rambla de Catalunya ends here and our last bit towards Placa Catalunya is in between of tourist restaurants and shops. 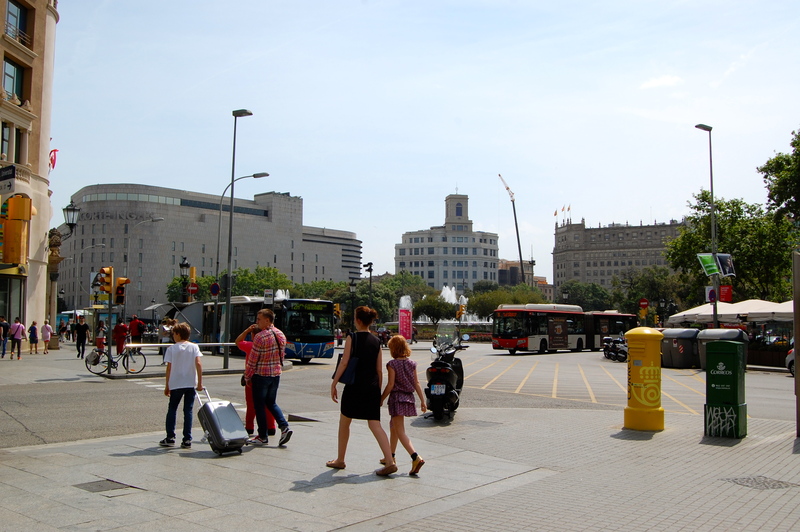 Here is Placa Catalunya with tourists crossing it in all directions. Two girls in blue dresses look back at us. They are nice. We stop at the elevator and take it down to the train station. It is 12:05pm and the walking is over. We take train to go back home. 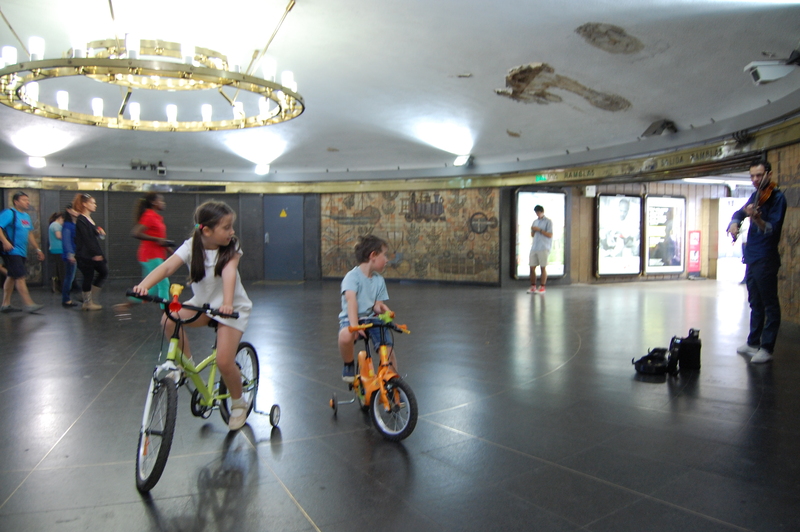 When we get underground we hear a violin playing a familiar tango. The kids stop and listen. They both want to play violin. They listen and listen till the tango ends. I give them couple of euros and they put them into the violin case. Then they listen some more.